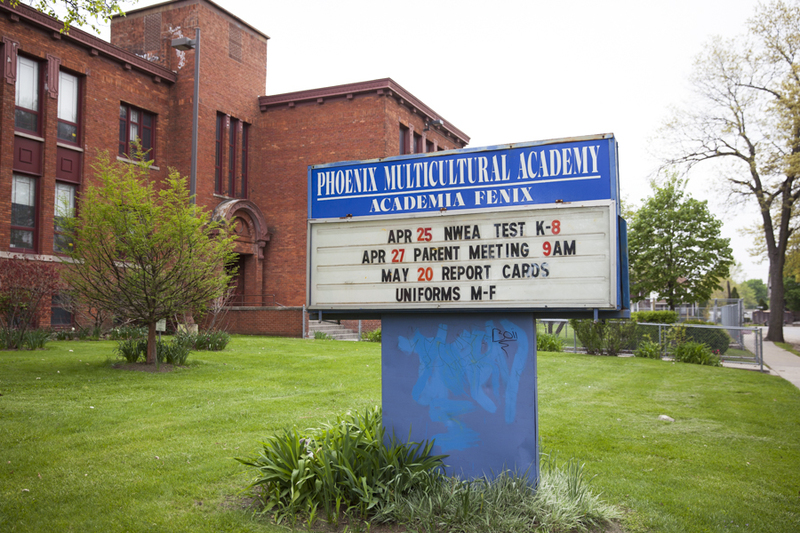 As you may or may not know Phoenix Academy, located at 7735 Lane Street, is closing its doors at the end of this school year due to low enrollment, according to the EAA (Education Achievement Authority of Michigan). The sign outside Phoenix Multicultural Academy on Lane Street shows recently updated dates of importance. The school will close permanently at the end of the school year. Urban Neighborhood Initiatives (UNI), in partnership with Congress of Communities (CoC), is coordinating a community engagement process to learn what the community would like to see happen with the building or in the building. UNI and CoC are facilitating this community engagement process to encourage residents and stakeholders to re-imagine future use of the Phoenix building in an effort to inform project plans of potential developers. Over the next couple of months they will be facilitating various forms of engagement (door knocking, small group discussions, social media surveys) in order to get input from a broad sector of the community, from residents most affected by the school closing to community leaders, business owners, and other stakeholders. Phoenix Academy’s playground and basketball courts were recently updated. The school will close its doors permanently at the end of the school year according to the EAA, who is in charge of this school and others under emergency management by the State of Michigan. Recent landscape improvements have made the areas outside the school more welcoming for neighbors with seating, newer soccer and playground equipment, and basketball court as shown here from bordering Evans Street. Question 1: What would you like to see happen with the building and surrounding land in the short term (1-2 years)? Question 2: What would you like to see happen with the building and surrounding land in the long term (5,10, 15 years)? Question 3: What is it that you don't want to see happen with the building and surrounding land? Thank you for participating and be on the lookout for more opportunities to provide your opinion and feedback on possible ideas.